The wonderful Emily at A Mummy Too wrote a post recently about 3 Books – a favourite book from childhood, a favourite adulthood book and finally a favourite parenthood book. I thought it was such a great idea. Finding the time and head space to read anything these days is a challenge, although one that I am doing my best to address. I am presently a member of three book clubs in various guises for a start…which doesn’t necessarily mean that I’m reading more books, but I am chatting to people a lot more about the potential to read more books! Finding only three books is a challenge, and if you asked me again next year I might give you a completely different set of answers but for now, here goes. Childhood: My childhood book choice is an Enid Blyton one. Considering how popular she is, it’s something of a foregone conclusion. However, my book is the lesser known ‘The Children of Cherry Tree Farm”, one of a series of books following the lives of four children, Benjy, Rory, Sheila and Penny, who are sent to live on a farm with their aunt and uncle to recover from illness. They meet a hermit called Tammylan who knows all about the natural environment and he teaches them what he knows. This series of books is far slower than the more adventurous of Blyton’s novels and really seem to exist to extole the virtues of country life, rather than having any major plot. Through ‘The Children of Cherry Tree Farm’ is a description of the British countryside through the seasons, with many wonderful things and the occasional nasty truth (usually the conflict between nature and farming) to make sure that the image of the countryside isn’t always idyllic. However, despite the lack of gripping adventurous plot, it is because of them that I became obsessed with self-sufficiency legend John Seymour. It’s because of them that I have always wanted to keep chickens, and have a list of breeds I would choose. It is because of them that I have an allotment and my own little fruit orchard. It is because of them that I know so many things; bats don’t get stuck in your hair, a hare will jump sideways to stop its scent being found by a predator, the difference between a stoat and a weasel. It may even be because of these books that I ended up where I am today, working for an environmental organisation. So, although I will read many different Enid Blyton books with my children as they grow older, I do hope that these become a favourite with them too. They made such a big impression on me that I’ve never forgotten as I’ve got older. Adulthood: I struggled a bit with my second book. Those of you who read this blog regularly, will know that I have two favourite novels – ‘I Capture The Castle’ and ‘War and Peace’. For the sheer reason that I re-read it when I am glum and it comforts me like a cashmere blanket, I am choosing Dodi Smith’s ‘I Capture The Castle’ here. It is a beautifully written and bittersweet coming-of-age story that I adore. The subjects of unrequited love, growing up with eccentric and difficult family members, struggling for money, the desire for beautiful things and the bloody difficulty of being in that moment, no longer a girl but not quite a woman either, bind together with poignancy and the odd moment of sheer comedy. I know every time I turn to it and read the opening line: ‘I write this sitting in the kitchen sink‘ that I will fall in love all over again. The difficulty with choosing an adulthood book is that these are my favourites so far. Although they have both been long-standing choices, the beauty of literature is that you never know what you might read next! Now it’s your turn. Choose your #3Books and add them to the linky at A Mummy Too ! Hooray! Someone else who loves reading ‘My Naughty Little Sister’ stories. ‘I Capture the Castle’ is fab too. My youngest sister Hannah introduced my to that. 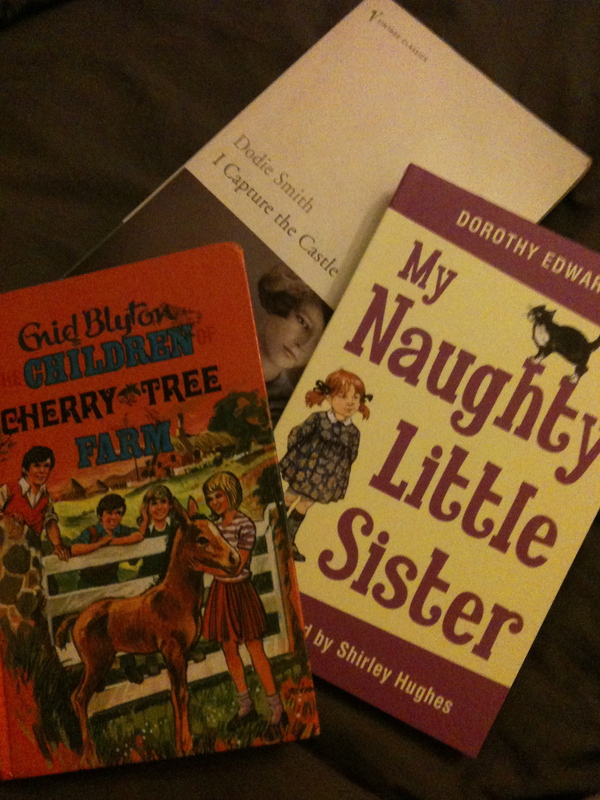 And I’ll add ‘The Children of Cherry Tree Farm’ to my ever-growing list of Enid Blyton books to revisit. This is lovely, thanks so much for sharing your favourites and for linking up. Three more books to add to my reading list! You’re right – I’m sure that I’ll have to be a bit creative when I’m reading Enid Blyton too – although by then, they might be reading for themselves so it’ll be more a case of explaining anything that’s outdated. I have a rose-tinted view of them though, so, like you, I want them to read them. 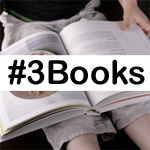 Are you going to do the #3Books link? You should!